For some, the Dome of the Rock is just an image from a travel poster, identifying Jerusalem in the way the Eifel Tower identifies Paris. But to billions of people, the famous golden dome, perched atop a blue porcelain base, is much more than a landmark – it shields a rock with enormous spiritual power. 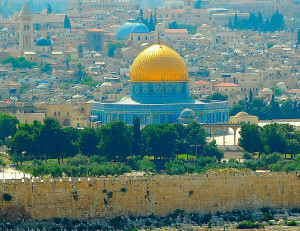 The Dome of the Rock sits near the center of the Temple Mount, a 37-acre platform just across the Kidron Valley from the Mount of Olives, built by Herod the Great in 19 B.C. Most scholars agree that the Jewish Second Temple once stood on this platform. But when Islamic armies captured Jerusalem from the Byzantines in 634 A.D., the Second Temple was long gone, having been destroyed by the Romans in 70 A.D. There are reports that the Temple Mount was being used at the time by Jerusalem’s then mostly Christian residents for their garbage, not knowing its original purpose. The new rulers of Jerusalem decided that the area surrounding an outcropping of rock on the flat surface of the Temple Mount would be the perfect spot for an imposing building announcing that Islam had arrived in the holy city toward which Muhammad and his followers had originally prayed. 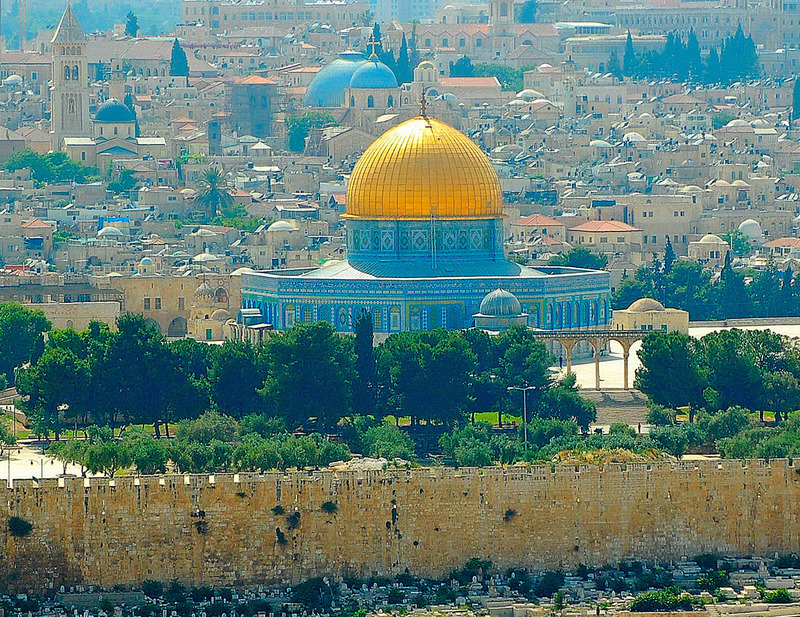 Reflecting Islam’s nascent rivalry with Christianity, the Dome of the Rock, completed in 691 A.D., duplicated to within a few inches the dimensions of the blue-grey dome covering the tomb of Jesus on the nearby Church of the Holy Sepulcher, the holiest site in Christendom. To make clear Islam’s key disagreement with the teachings of Byzantine orthodoxy, Arabic words were inscribed inside the dome asserting that Jesus was not the divine Son of God, but was instead his true prophet. Most Muslims today associate the rock beneath the dome with a magical night ride they believe Muhammad made to Jerusalem in 621 A.D., from which he traveled to heaven and spoke with Abraham, Moses and Jesus. As a result, the Dome of the Rock and the Al-Aqsa Mosque of which it is a part are the third holiest sites of Sunni Islam, after Mecca and Medina. But many Jews and Christians believe the dome covers the rock on which Abraham had been willing to sacrifice his son, that King David later purchased for an altar to God and, most importantly, around which King Solomon, following God’s instructions, built the First Temple. So for those who dream of a Third Temple exactly where they believe God said it should be, the Dome of the Rock is not a holy memorial, but an unwelcome obstacle. Ironically, Jerusalem’s beautiful golden dome covers a rock at the very center of religious contention.